The Affordable Care Act (ACA) introduced premium tax credits to give you and your family a discount to buy individual health insurance coverage through the Health Insurance Marketplace. If you are eligible, these tax credits can reduce your family’s health insurance cost to no higher than 9.5 percent or as low as 2 percent of your household income. Before you can calculate the amount of your premium tax credit, you must first calculate your modified adjusted gross income (MAGI). Note: Keep in mind that premium tax credits can work with reimbursement plans like the qualified small employer health reimbursement arrangement (QSEHRA), but that you must report your HRA allowance amount to avoid tax penalties. Your MAGI is a measure used by the IRS to determine if you are eligible to use certain deductions, credits (including premium tax credits), or retirement plans. Eligibility for the premium tax credits is based upon whether your income is no more than 400 percent of the federal poverty line (FPL)—modified adjusted gross income, not adjusted gross income (AGI). 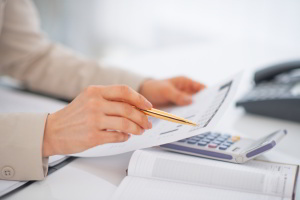 Here's a quick overview of how to calculate your modified adjusted gross income. Generally, your adjusted gross income is your household's income minus various adjustments. Adjusted gross income is calculated before the itemized or standard deductions, exemptions, and credits are taken into account. Generally, your modified adjusted gross income (MAGI) is the total of your household's adjusted gross income plus any tax-exempt interest income you may have (these are the amounts on lines 37 and 8b of IRS from 1040). Your gross income (GI) is the money you earned through wages, interests, dividends, rental and royalty income, capital gains, business income, farm income, unemployment, and alimony. This is the basis for your AGI calculation. Adjustments can include items like some contributions to IRAs, moving expenses, alimony paid, self-employment taxes, and student loan interest. There are many free AGI calculators available online. Once you have adjusted gross income, you "modify" it to calculate your MAGI. For most people, MAGI is the same as AGI. The IRS phases out credits (including premium tax credits) and deductions as your income increases. By adding MAGI factors back to your AGI, the IRS determines how much you really earned. Based on that, it determines whether you can take full advantage of premium tax credits. If you are eligible for a tax credit, an online premium tax credit calculator will help you estimate your actual tax credit. Editor's Note: This post was originally published in August 2014. Do you have any questions about premium tax credits? Please leave a comment below. Offer a health benefits plan that lets employees use their premium tax credits.